Amazon's product recommendation technology can be pretty insidious in its accuracy, like the day that this version of Stephen Sondheim's Company came up on my page. And while I knew that Neil Patrick Harris had performed in a run of the musical, I wasn't expecting there to be a recorded version of it. Such recordings aren't quite the fashion these days for one reason or another. Of course I wasn't quite expecting to find a full version of the production up on YouTube when I went online to verify if this recording was indeed a true thing. And so I'll admit that I've watched it, but I will get around to securing my own copy of this thing in time. Honest. This is really more of a concert performance than just a full stage musical. But it was still a lot more involved than some of the other concert shows we've seen over the years like that anniversary concert for Les Misérables. But hey, theater is theater and we'll take things in any form that we can get, right? And thus such live recordings remain to be real gems. 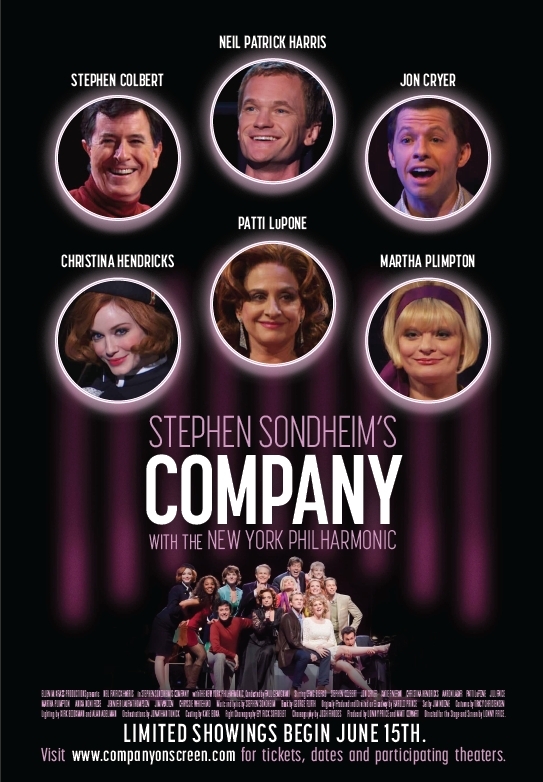 Synopsis: Company is a musical comedy with music and lyrics by Stephen Sondheim based on a book by George Furth. It originally debuted in 1970, but this 2011 version is a staged concert production directed by Lonny Price and was staged at the New York Philharmonic. Robert (Neil Patrick Harris) is a single man living in New York with a rather supportive circle of friends. For Robert's 35th birthday all of his friends gather to throw him a surprise birthday party of sorts, and thus we discover that all of his friends appear to be happily married or at least in committed relationships. And from that party we start to explore the individual stories of these various couples in a series of vignettes. Alternately we also explore Robert's history in terms of the different women he's dated in recent years. In one visit, Robert introduces us to Sarah (Martha Plimpton), who is passionate about food but is trying to stick to a diet, and her husband Harry (Stephen Colbert), who clearly had a bit of a drinking problem and his doing his best not to drink. Peter (Craig Bierko) and Susan (Jill Paice) seem to be the portrait of the perfect married couple, but then they shock Robert by revealing that they're planning to get a divorce. Jenny (Jennifer Laura Thompson) and David (Jon Cryer) entertain Robert one afternoon and he indulges them in some marijuana - something that David enjoys but Jenny secretly doesn't. And then there's the wedding between Amy and Paul, although Amy's going through some major pre-wedding jitters. And of course there's Joanne (Patti LuPone), who has been through the most marriages (and thus the most divorces), and certainly has a more jaded view of things. As far as "staged concerts" go, this one still felt like a full play, albeit with rather minimalist sensibilities. The couches were sort of central pieces that were decently easy to wheel around the stage and reconfigure into the various apartments of the couples or even in a bar. And I loved how they also incorporated the conductor's platform into the scenes, which really just showed that there was some clever stage design at work here. The cast is rather impressive from top to bottom and everyone does quite well in performing their character roles. I was a little surprised at how well Stephen Colbert fit into things despite his often over-the-top TV personality that we all know him better for. They work rather well as an ensemble, but of course there are stil those stand out performances. Neil Patrick Harris is already quite the darling of the entertainment scene, but more than his reputation, really does a good job as Roger. There's a fair amount of complexity in the sort of narrator figure at the center of all the little stories that he portrays and he does quite well in this regard. This is not his Barney TV character singing a lot of stage - he's still rather distinct and unique in how he comes across. I already liked a lot of the songs from this musical including "You Could Drive a Person Crazy," "Side by Side by Side," and of course the titular "Company." But beyond that there is of course the forever amazing "The Ladies Who Lunch" which was wonderfully performed by Patti LuPone. Some might dare say that she's a little overrated, but I think her unique talent range was perfectly suited for the often bitter and jaded Joanne. And thus she managed to do that key song justice and really brought the show home at that moment. Company remains to be a powerful collection of stories that sends a greater message. But admittedly that message may be different for each person and it also varies based on what you may be going through in your life when you decide to watch it. And therein lies the genius of the show, and thus I'm happy to rate this performance as 4.5 snarky asides by Joanne out of a possible 5.